It’s not often I get excited about unoaked chardonnay but from the very first sip Hunters Marlborough Unoaked Chardonnay 2016 set out to impress me. It’s soft, almost creamy in the mouth and actually quite complex. It has those lovely lemon biscuit / oatmeal / nutty notes offset by well-balanced acidity and hints of just ripe, skin-on peach. It has structure and although not stated I have no doubt it is from high solids ferment and lees stirring that took place afterward. It’s a very sophisticated dry white indeed. I matched to lemon chicken (pretty ubiquitous in my house). For pinot gris fans that don’t like Chardonnay I really suggest you try this. It has 13% alc and costs around NZ$18.99 a bottle. Check out hunters.co.nz. This is a similar post to that on my SueCourtneyWineWriter Facebook page. 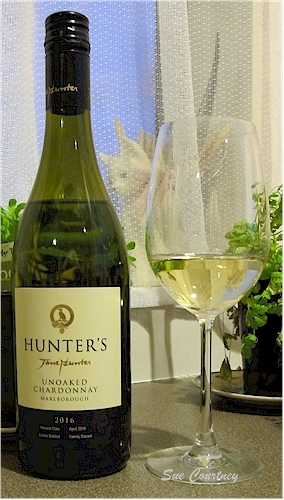 This entry was posted in #nzwine, chardonnay, marlborough and tagged Hunters, unoaked by Sue Courtney. Bookmark the permalink.